I was back walking along Port de Javel this evening. The installation of steel sculptures by Carmona are still there, so I circled around a few of them to try to take a few more pictures. I end up choosing “Brisas” (meaning breezes) for the blog upon reflecting on the weather forecast that is to come. I’ll be away for a long weekend break in a couple of days, participating in my first pont ritual ever. The weather forecast is looking good for now but it also appears we’re due for some wind and rain by the end of the weekend. I hope that’s just erroneous forecast. I want a full, sunny long weekend. Afterall, when I was busy slaving away working during the weekends in April, every threat of thunderstorm had been met with pretty blue skies, causing a massive tug of will between being good and staying in to work, and to sit out and have a long picnic. If you ever find yourself crossing River Seine southward at Pont d’Austerlitz, you will see this magnificent building right ahead, surrounded by a beautiful garden. When I saw it for the first time, I wondered whose grand palatial residence could it be. But this is Paris, where real estate is at its premium, so really, who could afford to live in a place like this? Turns out, a bunch of preserved (or models of) animals and plants. 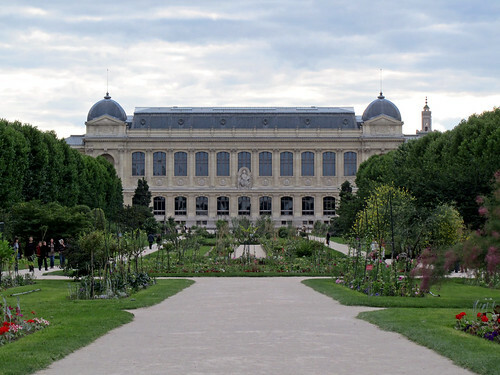 Or so I am assuming since it is the site of the Grande Galerie de l’Evolution, aka the Natural History Museum of Paris, and other NHMs that I’ve been to tend to house items of similar vein. I still have not yet been there for a visit – I should – but I have been told by an ex-colleague in Dublin how wonderful this place is. Certainly, the setting from the exterior has been charming. Now it remains how captivated I would be when I venture in one day. It’s time for tennis fever around here, with French Open currently taking place at Roland Garros. The festivities around the event must also be celebrated in the city, so right outside of Hôtel de Ville, a whole tennis-centric arena has been set up. 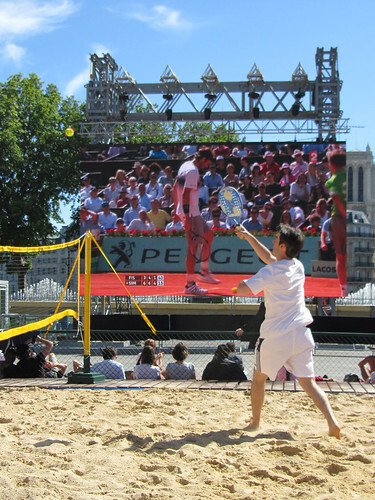 From beach tennis to games for youth to large screen that transmits live matches, on a sunny day like today, it makes an overall good day out for everyone. Around the city, in parks where tennis courts are available for public use, they’re certainly being booked pretty solidly at the moment. In part, it’s the Roland Garros effect. On the other hand, the weather has been obliging of late so why not take advantage of the nice warm day for a few outdoor matches? The municipal tennis courts can even be booked online, at €7.50 per hour at regular rate (€55 for subscription of 10 hours of usage). At Cité U, residents seem to be able to get a monthly rate of €20 for unlimited use but the information on the website is not entirely clear (well, to me anyway – clearly I still have a long way to go in learning and using French). 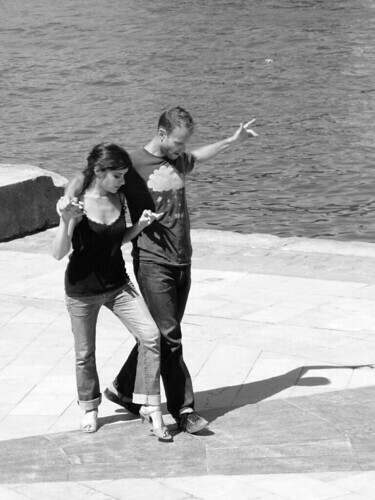 Summer months in Paris bring out plenty of outdoor activities, one of them being Danse en Seine where daily, from 6pm onwards, the amphitheatres at Jardin Tino Rossi are occupied by dancers and spectators alike. And everyone’s welcomed to join in and wiggle along. From salsa to tango to rock, this spells FUN to me even if I chickened out from taking part today. What can I say? It has been a loooong time since I last danced properly, so I was feeling shy about it. Besides, I was out on a photowalk and not exactly in proper shoes for dancing. I didn’t expect them to be there, since it was only mid-afternoon at that stage. Four couples were dancing to some pretty pop tunes but well-adapted to salsa dancing with the beats of one-two-three, five-six-seven. This pair were the best among them – with the guy leading very well and the girl dancing so very elegantly. I would be so lucky if I can do a fraction of what she did. They made all the steps and moves seemed so effortless. Anyway, next time I head out there again, I am going to join in. Wish me luck! So I was meeting Anne in the Marais yesterday. However, as I arrived early in the area, I decided to walk about randomly (like I always do). 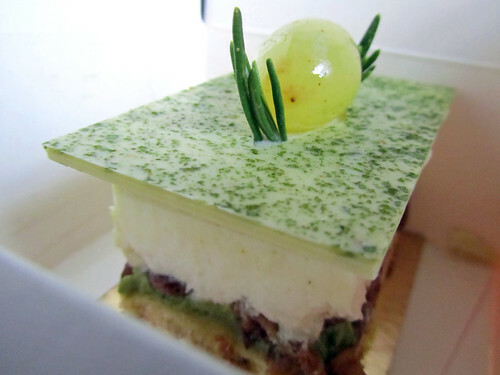 Somewhere along the route, I came across Patisserie Pain de Sucre and like a siren calling out to me, I automatically walked in to the shop and cue Pavlovian conditioning – droolfest! If I could have, I would have bought one of every cake and verrine in there. But I stayed sensible, and I came out about €16 poorer in exchange for 2 verrines and a slice of Gyokuro. The verrines have been eaten up after dinner last night, but there’s still this slice of cake left for today. Its full description reads: Biscuit madeleine à la pistache et zestes d’agrumes, crème au thé vert matcha, mousse coco, crémeux léger au thé gyokuro, feuille de chocolat au thé vert (madeleine cake of pistachio and citrus zest, cream of matcha green tea, coconut mousse, light cream of gyokuro tea, green tea chocolate leaf). I was quite sure I spotted rosemary inside one of the layers, not just decorative at the top, but I could have also mistaken something else for it. Perhaps it was green citrus peel? Gyokuro is amazingly light to eat and it tastes fresh too, perfect as a summer day treat. It is definitely the best buy of the lot, as the verrines were just too “busy” with all the complex layers contained in teeny tiny glasses. I liked them, but not enough to want a repeat. The cake, however, I could eat a lot more of it. I should try other varieties next time I pass by. Day 146: Running out of idea? 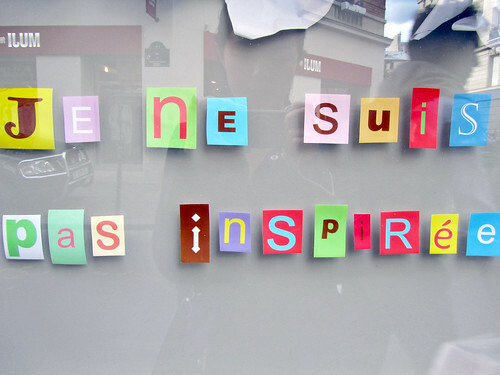 I was highly bemused when I passed this window on rue des Francs Bourgeois that claims “Je ne suis pas inspirée” because right now, that somewhat reflects how I feel. 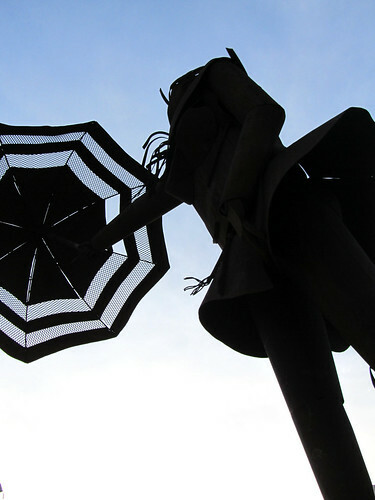 I know I haven’t been the most diligent when it comes to maintaining this blog up-to-date at all time, and I am a tad concerned if this is a bit monotonous for you since I seem to be photographing just a lot of statues/sculptures lately. I don’t exactly want to fall on backup idea, which would be to photograph all the famous sights of Paris, but to try to give you a flavour of what living here is like and what I see when I travel. Of course, one way to do it would be to photograph people, but I’m still a bit wary of my skill on this aspect and for fear that it may be intrusive. What say you? Any suggestion? Or is there anything in particular you’d like to see more of? Sainte Geneviève is the patron saint of Paris and standing really really tall on Pont de la Tournelle over River Seine is a statue of this wise and brave woman (who was said to have saved Paris from the plunders of Attila the Hun and performed numerous other miracles for the people of Paris), protecting the young Paris (depicted as a young girl here – holding a ship used by the Parisii tribe?) from all that sought to cause her harm. This iconography is similar to the stained window of Église St-Pierre de Montmartre (photo on Flickr) which would quite ambiguously tells you it is Paris that Sainte Geneviève is looking out for. In this creation, Paris is holding Notre Dame Cathedral in her hands. 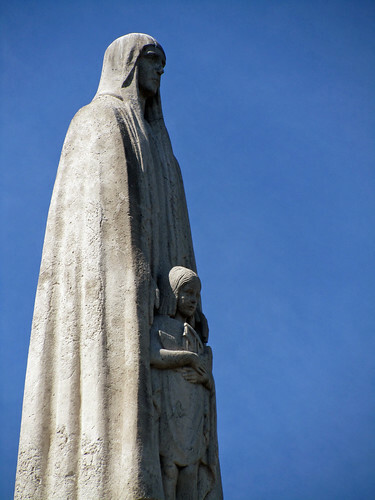 Of course, note that Notre Dame wasn’t built until several decades following the death (and canonisation) of Sainte Geneviève, the representation at Pont de la Tournelle would probably be a more accurate depiction. But, what do I know? I am no historian. While I was gallavanting around in Stockholm over the weekend, Chloé was on chocolate discovery mission. A new chocolate-tasting concept chocolatier has been found at St Germain, “between Pierre Hermé and Ladurée” (on rue Bonaparte), and wonderful friend that she is, she brought Anne and I a selection to try. Parc Montsouris seems like a good place to enjoy the last of the sunshine for the day and have chocolate tasting. 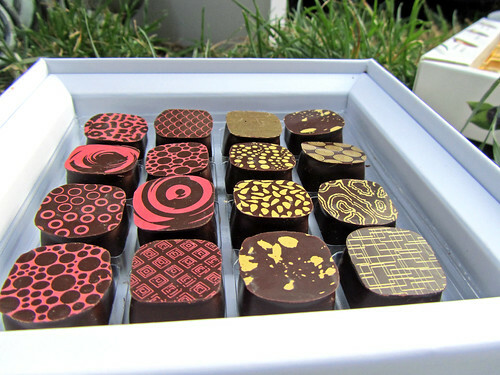 Chocolats Richart has plenty to offer but what we’ve got here are from two dégustation boxes – petits Richart Les Fruités (as the name suggests, fruity ganache filling within) and Les Hespéridés (for that fresh citrusy and extra zing of a flavour). All three of us prefer Les Hespéridés, even if we think there was a questionable (overripe) pineapple ganache in the selection. For next tasting session, I think we should get the other tasting selection, including Les Floraux (floral are usually good), Les Balsamiques (yup, balsamic! ), Les Herbacés (herbs and chocolate – interesting), Les Epicés (not sure though if I’m keen on a spiced-chocolate selection) and Les Grillés (with nuts, this I can do). Gustav III Museum of Antiquities is a rather peculiar museum. It is a museum of a museum, that is, it is a museum recreated based on the museum which used to be housed at the Royal Palace. For a period of time, these pieces were moved to National Museum. They were subsequently restored at the Palace once again, and reopened as Museum of Antiquities. Therefore, this is a museum honouring what was one of the oldest European museums. The museum is not particularly big, consisting of only two galleries. 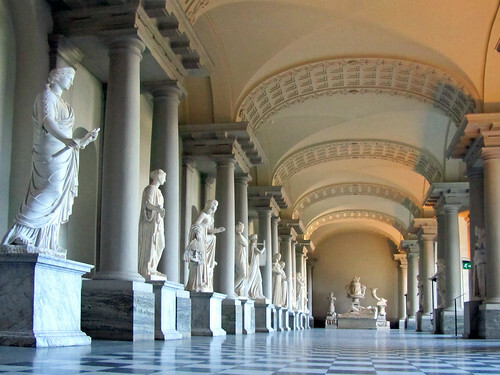 The bigger one containing a number of key statues, including Apollo and his nine muses, and Endymion, while the narrower gallery is used to mostly display busts of men of fame in the past. What’s quite amusing was listening to the guide explaining how rogue merchants of the past classified something as an object of antiquities from Roman civilisation. Apparently, as long as there’s at least 30% of original parts to the work, it was considered antiquities. And missing parts (limbs, attributes) can subsequently be replaced by, say, reconstructive sculpting works. Intriguing. Day 142: Wha’cha lookin’ at? Day 2 in Stockholm and more tourist-playing to be done of course. I still marvel at how different the city is in the summer, given my only previous trip to the Swedish capital was in winter (a coooooold February). Today, Åsa and I managed to squeeze in Stockholms Stadsmuseum, Vasamuseet and Skansen. Pretty good effort all round and a reasonable amount of walking, not that I’m complaining, as I’ve been pigging out on local food and could definitely use the walk to get rid of some of the calories. Skansen is the world’s first open-air museum, displaying buildings from various parts of Sweden (which had been shipped to Skansen piece by piece) as well as devoting a major part of the resources to retain cultural information of Swedish civilisation. Staff in period costumes can be seen in the historical village, and they are always on hand to explain how things work from decades of the past. There is also an open-air zoo at Skansen, exhibiting many Nordic animals including brown bear (and there were two cuddly baby bears! ), lynx, moose, wolverine etc. 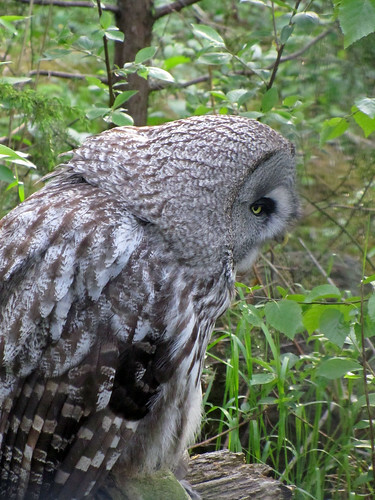 The owl must has sensed my excitement in exploring Skansen but given its imprisonment, it would only give me this “meh” expression.